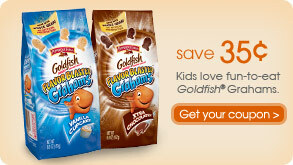 Pepperidge Farms has a $0.35/1 Pepperidge Farms Goldfish Grahams coupon on their site. If you have a store near you that doubles coupons, this could be an inexpensive snack for your kids. I’m glad that you can use this coupon too!